Ann Slee is NHS England’s Associate Chief Clinical Information Officer (Medicines). She is a hospital pharmacist by background and has led various local and national initiatives around digital medicines and ePrescribing with experience in the development and deployment of digital technologies. 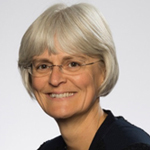 She holds several honorary academic appointments and was a member of the advisory board for the Wachter review. Ann is a Founding Fellow of the Faculty of Clinical Informatics.